So what is the Value of Advice? Why do people need advice? 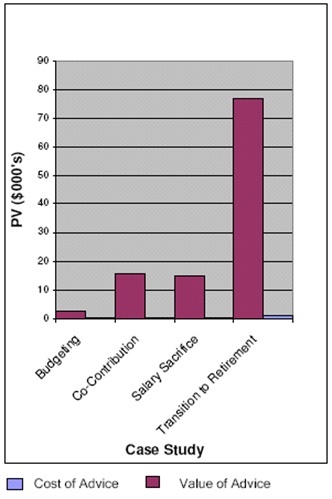 Firstly, if you think that relying on your employer contributions will be enough for your retirement….THINK AGAIN! It doesn’t matter whether it’s an employer fund, corporate superannuation, industry fund or your own superannuation fund you need to also get professional strategic financial advice if you want to achieve your goals. It is very difficult for a 65 year old who, after 45 years of work, has relied on employer superannuation contributions to have enough to retire comfortably. So why is strategic advice necessary? The system of retirement planning, superannuation and financial services in Australia is complex. People need advice in these areas. Not enough people are currently receiving it and as such their financial futures are potentially disadvantaged. Those individuals who receive advice tend to be more informed and more concerned about current investment and legislative conditions than those who do not receive advice. How is value added by receiving Financial Advice? First, and most importantly the strategic advice and secondly, asset management. Strategic advice includes focusing on your lifestyle and financial objectives, assessing the four key drivers (earn more income, pay less tax, protect your estate and effectively use assets and cash flow) for creating wealth, identifying the appropriate structures and providing constant revision, planning, managing and reporting. Strategy construction includes the impact of legislation, taxation and other external factors on your financial position. Staying on track to achieve your goals via our ongoing reviews, planning meetings and management. Being looked after by an adviser with whom you will have a personal long-term relationship and whom will know your family’s individual circumstances. Reduce the stress of managing your financial affairs by transferring part of the responsibility. 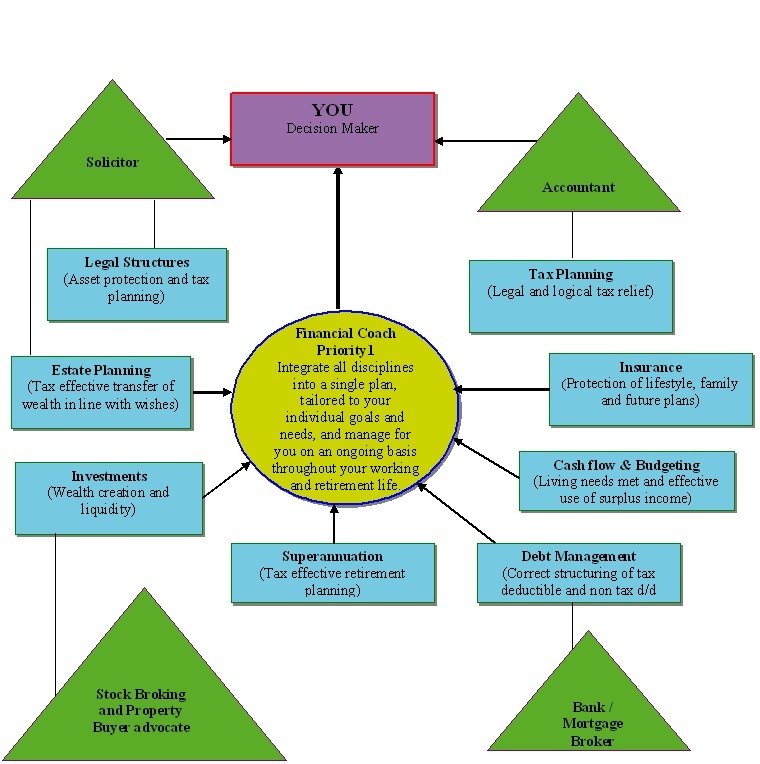 Network of professionals in the areas of accounting, taxation, finance, estate planning and legal structures. So how does a financial adviser help achieve this? So what is the dollar value of good financial advice?To ensure that you take advantage of or at least investigate the above, you need a close working relationship with a good financial planner. A study conducted by Rice Warner Actuaries, examined a number of case studies relating to advice provided to individuals and families. These case studies were analysed to provide a dollar figure benefit of the advice over the period of time the advice would be required. The case studies have a planning horizon ranging from 4 to 30 years. 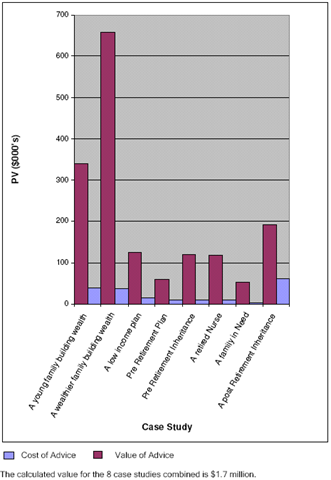 The chart below shows the value created for each case study. The value varies from case to case as there are differences in relative income and expenditure patterns, time horizons and goals. The charts demonstrate there is a key advantage in having an ongoing relationship with a financial planner in order to maximise opportunities and build the discipline of maintaining the long term plans for both full advice and limited advice strategies. What are the costs of Financial Advice?In addition to the financial value of advice, there is an emotional value provided from the peace of mind associated with a structured and stable plan, as outlined above. The cost of delivering advice ranges depending on the complexity of advice required. These costs can be paid either via upfront payment or through a fee based on assets under advice or a flat dollar fee. Advice obtained through self help (education) and call centres can be relatively cheap. More complex matters need to be dealt with through a face to face meeting. Value can be provided through a single review although the most comprehensive advice is provided through a continuous service with frequent reviews. This holistic advice requires a personal relationship with a financial planner and advice which takes into account all aspects of a client’s personal circumstances. The cost of this advice varies depending on individual’s personal situation. Advisers are always upfront with fees and charges and will discuss these prior to any advice being given. 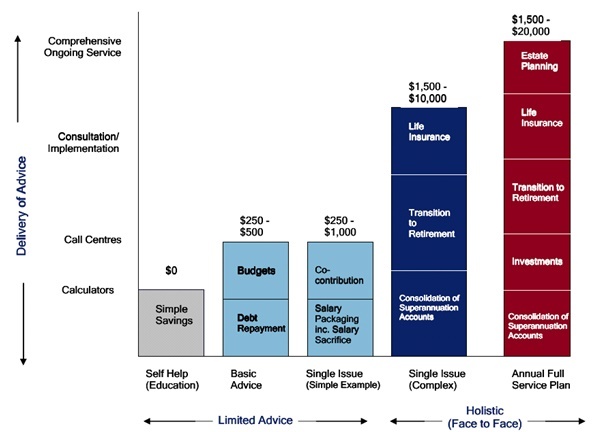 The table below shows the difference in cost and complexity of various pieces of advice. Financial Advice is valuable and more Australian’s should receive it. Surveys have indicated that 9 out of 10 Australian’s benefited from the experience of using a financial planner. While there is a cost associated with providing advice, the rewards of following the plan provided by the adviser, far outweigh the costs. For more information or to arrange a meeting please call Priority1 Wealth Management Group (Australia) Pty Ltd on (03) 9725 9078 or Contact Us to discuss.